West End has so many vegan options, sometimes places get overlooked. But I am glad that I took the time to try out Suburban Cafe. Located right next to Vegerama, it is definitely worth walking those extra few steps to check out. Especially as they have recently revamped their menu to have several more vegan options. The first time I went, I was meeting a group of people who were not all vegan. So this is a good place for groups with mixed dietary needs. This was back with their old menu, that only had a few vegan options on there. 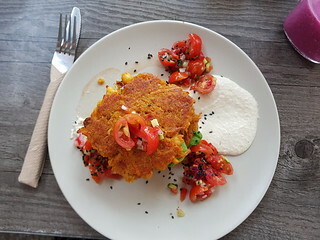 I tried the Vegan Fritter Stack, which was was nice and fresh, though I have no memory of what any of the special bits about it were. 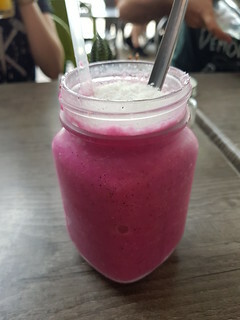 I also got the Iced Vovo Smoothie, but on almond milk rather than coconut milk. Another person ordered the vegan burger, which had a chickpea patty. It was several months before I went back there again, lured in by the promise of the pancakes on their new menu. These are SO GOOD! They have a pineapple glaze and salsa, with a lemon sorbet (that is not coconut ice cream). 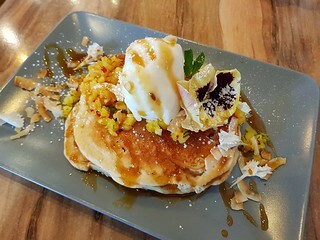 The pancakes themselves were fluffy, thick, and filling. And it was the perfect mix of not too sweet and just a little bit savoury. The sorbet was a bit of a letdown in terms of texture though. It was rock solid, so instead of melting into everything I had to cut it with a knife and fork! But still I highly recommend these pancakes! 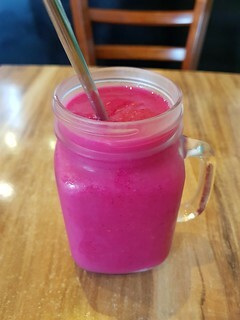 I also had a Raspberry and Pitaya smoothie, made with coconut water, which was so refreshing as I'd been to yoga that morning. The good news is that I will definitely be back soon to try more of their vegan options. Because I won a thing! So weird to have two posts one after each other about winning things, when I don't normally win things. And the posts ended up being close completely by chance. But I won a $100 voucher to Suburban in an Instagram competition! Yay Instagram competitions! So there will be lots of new menu trying in the near future. A flash back to some of our adoption kitties being very silly! You have to go and run buy a lotto ticket NOW!! Nice winning streak lately! That bright crazy pink smoothie is amazing- and who doesn’t enjoy good pancakes? 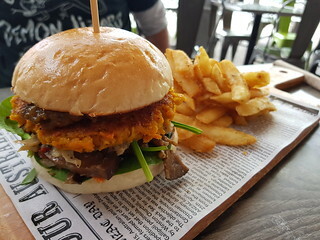 Brisbane is quite food for places that can cater to all sorts of diets, which is nice when you are the only vegan but you want to eat more than a sad salad. Lemon sorbet on pancakes sounds amazing, what a let down that it was hard!! I agree, you are on a total winning streak with your meals lately!! 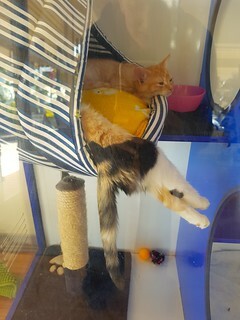 I love the kitty legs and bum hanging out of the tower!! She was letting it all hang out! The vegan burger sounds great, and I'd especially love to try those pancakes -- they look amazing! Silly kitties!